The Beach Club II - Four plush acres of Hallandale Beach provide the backdrop for The Beach Club Two. Enter in style as our two-story lobby entrance welcomes you to luxury. Take in marvellous ocean views with over five hundred feet of ocean frontage. Well-kept landscaped grounds tell the world that you settle for nothing less than the best. The Beach Club II in Hallandale Beach is the second of three buildings comprising a condo community located east of Ocean Drive with a location directly on the beach, just like the name suggests. 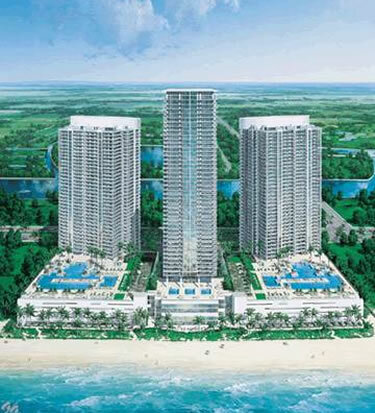 It is one of many projects by the Related Group of South Florida and features over 300 Hallandale Beach condos for sale within its 52 stories. Residents of the Beach Club II condo will find more than 489 feet of beach and ocean frontage in addition to features like a pool deck with a snack bar and various services offered so that you can remain near the heated pool if you prefer. Floor to ceiling windows, oversized glass railed terraces, marble bathrooms, European kitchens with granite countertops and stainless steel appliances, these are some of the residential features available at the Beach Club II condominium. Besides the beach the Seawalk Pointe Shopping Center is near Beach Club II. Hallandale Beach Boulevard is west of the building along with a shopping center that includes a Walmart Supercenter. Additional places and sights like Hollywood and Aventura Mall are also just a couple of minutes away. You'll also find several parks of varying sizes to the south of Beach Club II.